Any modern air force needs the ability to test and evaluate new aircraft and weapons systems before they enter widespread service. This task can range from an entirely new and developmental design to the modification of an existing type, including the integration of new weapons systems. In the case of the Luftwaffe this task has fallen to Wehrtechnische Dienststelle 61 (Test and Evaluation Unit 61). This book by AirDOC regulars Bernd and Frank Vetter gives those interested in the history of the Luftwaffe in particular and aviation T&E in general a concise history of this highly specialised unit. 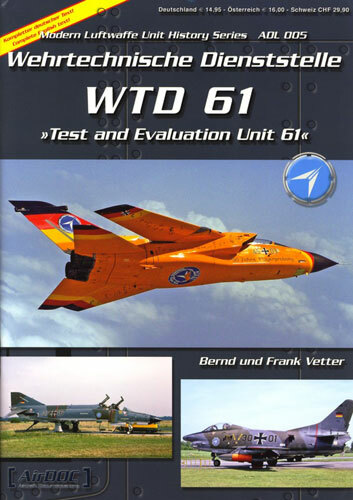 It covers from its origins in 1957 till the very latest programs that WTD 61 is conducting from its base in Manching and other locations around the world. Each chapter deals with a specific phase of the units varied test programs, with chapters such as "V/STOL Programs", "Into the 70's" and "Current Projects" giving an indication of their span. Test and Evaluation units by their nature generally have a wide variety of tasks and aircraft on strength at any given time. Further these aircraft often sport unusual colour schemes, airframe configurations or weapons fits to meet the needs of the role. Being an AirDOC book it is filled with excellent photographs documenting some of these non-standard aspects of otherwise familiar aircraft. There are excellent photographs of the F-104 Short Airfield for Tactical Support (SATS) trials and the associated ZELL rocket launch system, many images of the F-4s and Tornados throughout their development life and even coverage of the DA Eurofighters and RQ-4 Eurohawk aircraft that have passed through Manching. Also nice to see was the section on the former Egyptian Su-20 Fitters acquired in 1983 to evaluate due to the widespread employment of similar aircraft in the WARPAC orbat. Once again this is a high quality product from AirDOC, one that is sure to interest those with a bent towards the unusual in their modelling themes.